It had been a rather rainy, but exceptionally mild, November here in Norfolk up until the weekend when we had a taste of real Winter weather - a sprinkling of snow and our first frost. 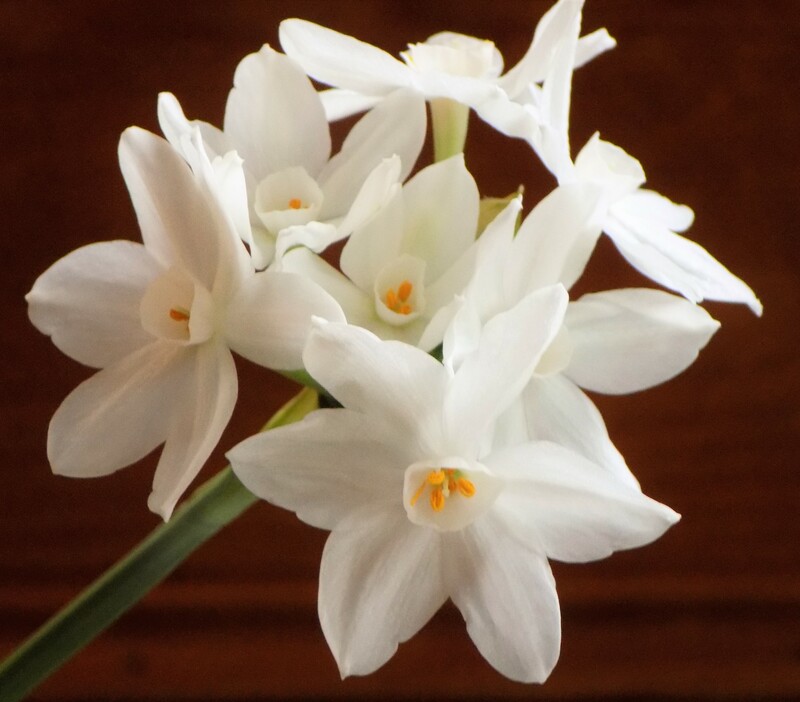 Although the arrival of the first frost does spell the end to annuals like Ammi, Sunflowers and Cosmos, there are still a variety of flowers that you can bring into the house, from forced bulbs like Narcissi 'Paperwhite' to branches of Winter-flowering shrubs. 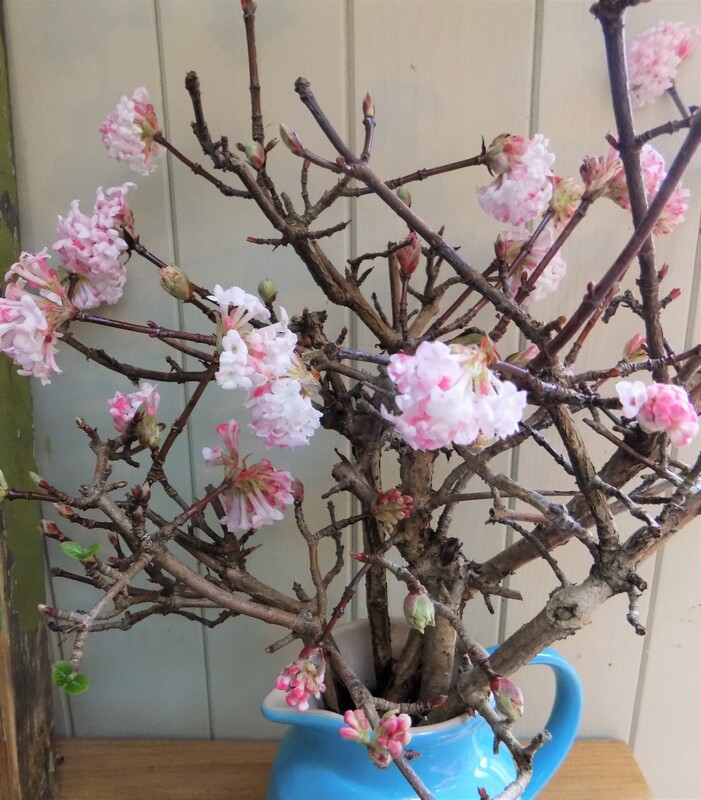 As I write this, I can smell the heavenly scent of Viburnum bodnantense 'Dawn'. The flowers are numerous and a pretty pink colour, and the scent is incredibly intense. I can smell them as soon as I enter the house. This is a great shrub to make room for in the garden. I've had some lovely vases of flowers for most of November, including a late crop of Cornflowers, which sprang up, self-sown, and a late crop of the Ammi majus which I struggled to get to grow earlier in the season so the late batch were all the more welcome. My annual Chrysanthemum 'Polar Star' never really got off the ground and my Zinnias have been a big disappointment with only a few blooms to pick sporadically. The true stars for this time of year have been my Scabious - 'Black Cat' and 'Tall Double White' which actually look like they might survive the frost for a while longer. My Dahlias have, I confess, been a bit neglected in their pots, so didn't flower for quite as long as I'd hoped. I have now brought the pots into the potting shed where they will over-winter away from the frost. I will plant them out again, this time into their own cutting bed, which will be devoted to Tulips and Dahlias, where I think the larger varieties will fare better. I've already got flowers on the Narcissi 'Paperwhite' bulbs that I potted up in October. They have a wonderful scent and are very tall and elegant. They need some form of support. I've used hazel twigs and tied in the flowering stems with jute twine to give a natural look. Over the course of the last few weeks, I have been planting small bulbs (Irises, Snowdrops and Muscari) in some small decorative containers and terracotta pots, every week or so in the shelter of the potting shed. Once in flower, I will bring them into the house for an early Winter display. By planting in succession, I should ensure a continuous display of bulbs for a few months at a time when there are no annuals to pick. After flowering, they can be planted out into the garden borders for flowers next year. My Amaryllis bulb, planted last month has a green shooting tip and I'm hoping it will be in flower by Christmas. November is the best month for planting Tulips but you can go into December with their planting. At this time of year, retailers start slashing the cost of Spring-flowering bulbs so there are opportunities for grabbing some bargains. I've invested in some new varieties this year and what a huge variety of Tulip flowers there are! From elegant Lily-shaped flowers, double Peony-like flowers and showy, frilly Parrot versions. Go for your favourite colours but grow a range of shades and flower shapes to complement each other in the vase. I'm going for the red, frilly, Parrot-flowered 'Rococo', 'Blue Parrot' - a wavy, mauve-blue flower, 'Angelique' - a romantic, soft pink Peony variety and 'Showcase' which is a large, dark red, double form. I also have a blended mix of Tulips (varieties unstated!) in shades of white, pink and purple which were cheap in the supermarket. In the garden borders, I have the wonderful, and very popular, dark 'Queen of Night', alongside 'Exotic Emporer, 'Purissima' and 'Blue Amiable'. I mainly leave these for the garden display but can't resist cutting a few to bring inside. See my Pinterest page for pictures of all Tulips mentioned. 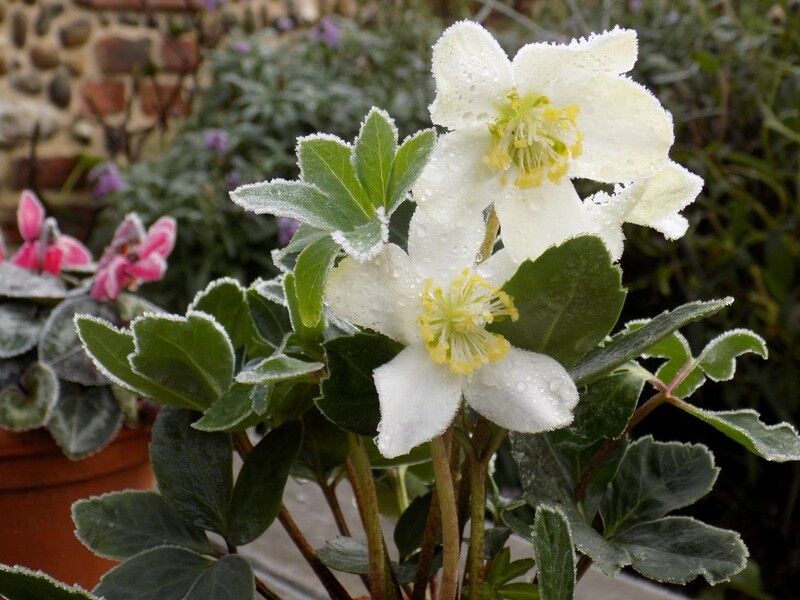 Hellebores start flowering in Winter and on into Spring and make lovely cut flowers. They don't last long in the vase so I usually have a few potted up and placed on the table in the courtyard outside my patio doors so that I can still enjoy them from afar. If you wait until the flower ages and the stem gets woody, you can cut the bloom and it will survive a lot longer in a vase than when fresh. Other sources of cut material include Winter-flowering shrubs such as Skimmia japonica, Viburnum tinus, Viburnum bodnantense, Witch Hazel and Daphne odora. Try to include at least one of these in the garden as they bring a welcome splash of colour, usually coupled with a lovely scent if you want to cut a branch or two to bring inside. I'm looking forward to December now and the opportunity to make some Christmas wreaths with some evergreen foliage and berries from the garden, along with some natural, homemade decorations. Amaryllis, or Hippeastrums as they are more correctly named, bear beautiful, exotic looking flowers and are really easy to grow. Just plant the bulb in good potting soil. Some thin, twiggy birch or hazel sticks added to the pot will provide some support to keep the blooms upright, but little else is required. Water regularly and provide bright, indirect light. Blooms will appear four to six weeks after planting. Having never grown them before, I've decided on growing just one this year to see how I get on and then treating myself to a new variety next year. You can keep bulbs for flowering again the following year so they are a good investment. I like the idea of having some flowers on display in the house in the dark Winter months. If you plant your Amaryllis towards the end of October then you should have blooms in time for Christmas. I've chosen a variety called 'Lima' which has deep burgundy flowers with a hint of green. There are some lovely understated varieties on offer. I've been put off in the past as some Amaryllis flowers seemed a bit loud and vulgar but if you browse the bulb catalogues, you are sure to find one that you like. Think about your interior decoration and what will look good in your house. Plant each bulb in a heavy, 6-8" pot. You can add a drainage layer of crocks or gravel to the bottom of the pot to assist drainage and also provide ballast. Lightweight pots may tip over. 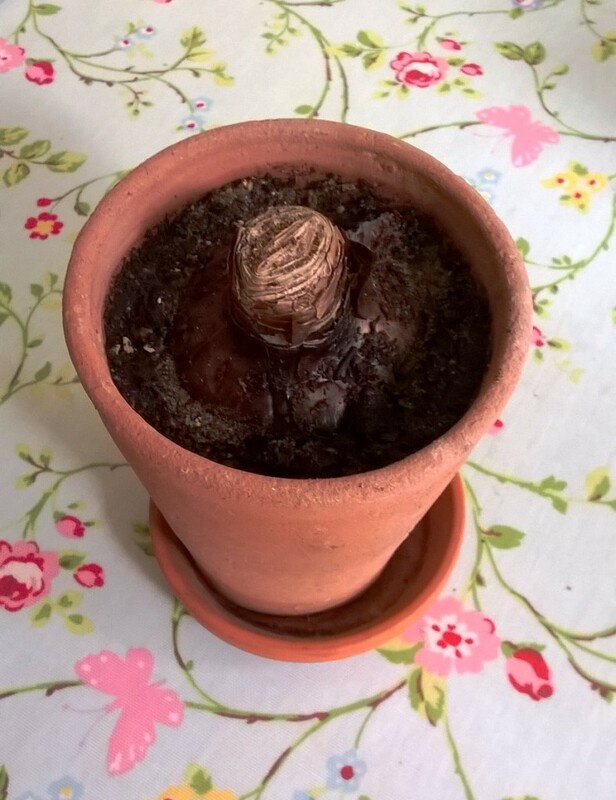 Plant the bulb, pointed-end-up, in potting compost. Pack the soil gently around the bulb so approximately one-third of the bulb remains above the soil. Place in a sunny location, out of direct sunlight, and water sparingly until you see about 2" of new growth. From then on, water regularly. As the plant grows, turn the pot periodically to encourage the stalk to grow straight. 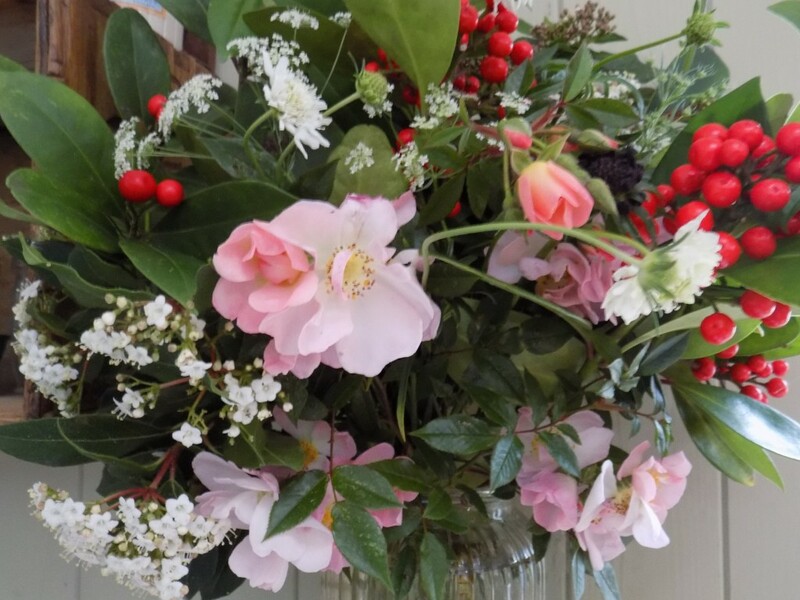 Within five to eight weeks, you will have an exciting and dramatic floral display. When in flower, if you move the plant to a cooler place, about 15–18°C (60-65°F), you will extend the flowering period. Each individual flower should last two or even three weeks before they go brown. As each one fades, cut it off at the top of the stalk. Amaryllis can be encouraged to flower again the following year. It just takes a little planning and extra care, but it is worth it if you find a variety you really like. When the whole stalk has finished flowering and begins to sag, cut it to within 1" of the top of the bulb. Continue to water and feed regularly with liquid houseplant feed. Your bulb will grow a few leaves during Spring and Summer to help produce energy for the following year's flowers. In mid-August, start to withhold water and let the foliage die back naturally until the pot dries out completely. 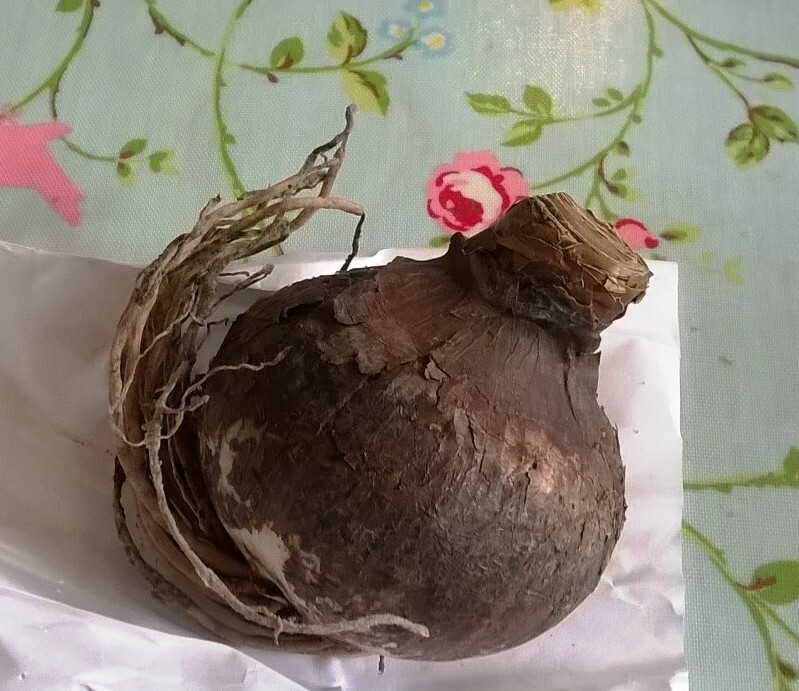 Store the dormant bulb in a cool, dark and dry place for a minimum of eight weeks. Approx. 5-8 weeks before you want the Amaryllis to flower again, repot the bulb in fresh potting soil and resume watering — sparingly at first. Once you see new growth, increase watering. By following these basic guidelines, you will be able to encourage your amaryllis to flower year after year.